Indy Mouse enjoys searching for public photos and clip art about Indiana history that will go well with new Indiana-related stamp issues. 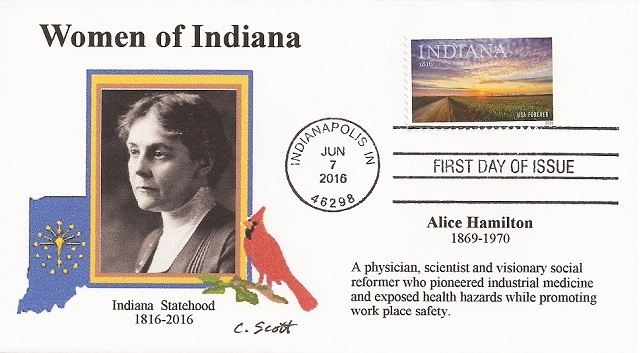 This new cachet line was inspired by the Indiana Statehood Bicentennial issue of June 7, 2016. Indiana's 200, 1816-2016: The People Who Shaped the Hoosier State, published in 2015 by the Indiana Historical Society Press. Forty of the two hundred people described in the book above were women who helped shape public policy and attitudes, impacted the arts and education, or contributed to business and the economy. I selected ten of the forty for this first set of cachets. Public domain images are framed by an Indy Mouse special design and accompanied by a brief text profile. This sample is design number four in the set. See the Indy Mouse shopping page with all ten designs. See the 2016-2017 Indy Mouse cachets produced after the first ten.